It was in 1995 when I noticed a new adventure computer game simply called Discworld. The box cover looked intriguing and when I saw that Eric Idle was voicing the lead role, it was an instant buy. I was lucky, because the game was still available in its English original in our German shops – a short time later only the translated version with German voices was available. I loved the game with its quirky humour, clever story and witty dialogue. Of course there was also the completely unique setting of a medieval city on a flat world traveling through space on the shoulders of four elephants, which are standing on a giant turtle. While this had actually not that much do to with the game’s story itself, it was an uttery fascinating and enormeously funny idea to me, the complete opposite of the conventional fantasy genre. In the box was an advertisement by the German publisher of the Discworld books and I bought a few of the translations. While these were entertaining, they somehow lacked the linguistic spark the adventure game had – it was clear that the English versions were much better. Fortunately one of our local book shops had some of the English paperbacks available, and at the end of 1995 I had read nearly all of Terry Pratchett’s books available then, some of which I had bought on a trip to London that year. Since then I’ve been reading every new book and I regularly come back to the old ones – but I’ve never gone back to the German translations, which are actually really awful and do not do the originals justice at all. This is my story how I discovered Discworld and Terry Pratchett – I was not there from the beginning, but it feels like I have discovered his works exactly at the right time. For the past eighteen years, which do not really feel that long, Discworld and Terry Pratchett have been an integral part of my reading diet. This may seem strange because while I like science fiction, I am most definitively not a fan of straight, serious fantasy. But Terry Pratchett does something entirely different – his works had originally begun as clever parodies, but have since matured into a completely own universe which has become fully independent. Discworld is not actually tied to a single genre, but is collection of several ones which are not only satires or parodies, but especially in the later books full-grown, independent stories. He chronicles the evolution of his unique Discworld universe in many different ways and the stories from the most improbable fantasy world of them all have become more and more complex and interesting. There is the transformation of the mighty city of Ankh-Morpork from chaotic medieval times into a victorian industrial age, partly told from the perspective of a policeman who has pulled himself from the gutter, rebuilt his police force and became a duke and even a diplomat and politician. The story of the small kingdom of Lancre with its witches is also told over several novels, even spawning a sideline with young adult books. Death himself is a main protagonist of many stories and of course the adventures of Rincewind and the wizards of the Unseen University span a lot of books. Lately the author has even introduced some completely new main characters, but he also often references his earlier scenarios. There are many more stories, but a complete list would go wildly beyond the scope of this article. There are now nearly forty Discworld novels and the sheer volume of storytelling can be intimidating for new readers – fortunately there are great reading guides available on the web, which are essential for any Discworld beginners. Several official maps have been created, whole books with drawings and paintings are available and even an encyclopedia is among the numerous secondary literature about the Discworld, always created by many collaborators with the help of Terry Pratchett himself. There are also four graphic novels and several stage adaptions – and of course three great adventure computer games, of which the first one was the beginning of Discworld for myself. In addition, all of the novels exist as brilliantly voiced audiobooks in both abridged and unabridged versions, some have even been adapted as radio plays. Sadly, a few years ago Terry Pratchett was diagonosed with a rare form of early-onset alzheimer’s disease and while he is already suffering from some of the symptoms, his mind is working overtime and with the help of his assistants and speech recognition software he is still capable of writing. How long he will be able to go on is even unknown to himself – he has been openly talking about assisted suicide and even has made a documentary about the subject, but he insists that he is still going strong and not giving up easily. The release schedule of one Discworld novel per year has never been really interrupted and in fall 2013 the 40th book will be released. Terry Pratchett is even doing some extracurricular work – his dickensian hommage Dodger was released last year, as was his collaboration with Stephen Baxter on a science-fiction novel called The Long Earth, which will spawn a sequel this summer. Will the Discworld stop at number 40? Terry Pratchett has told many tales, and a lot of storylines have now all but finished. There may be more to tell, but it all depends of the mental health of the author. He says he has not been able to physically write himself either by hand or on a keyboard for a long time, but instead he works with voice recognition or with his long-time assistant Rob. There have been reports that he will hand over the Discworld empire to his daugther Rhianna, who is an author herself, when he is not capable of writing any more, but he has denied this – although she will be the keeper of the Discworld in the future. What will happen to Discworld when the time really comes for Terry Pratchett to say goodbye is unknown at the moment, but I think this will still be a long way off because he seems to be doing amazingly well considering the circumstances. Of course Discworld does not only exist solely in book form. While adapting Terry Pratchett’s novels for television or even cinema has always been very difficult because of his very british humour, there have been some amazing productions in England. In the late 1990s Cosgrove Hall had adapted two of his books successfully as animated television series and about ten years later a group of british filmmakers called The Mob started to produce live-action versions, all with the full cooperation and support of Terry Pratchett – three two-part movies have already been made and another one will be filmed this year. There are also rumours of a forthcoming television series based on the City Watch storyline, to be produced by Terry Pratchett’s own company for the BBC with his daughter Rhianna among the writers. The adaptations will never completely surpass the books, but they are all wonderful interpretations of the original stories and have been an invaluable addition to the Discworld universe. While Terry Pratchett’s novels have certainly become huge bestsellers, Discworld is not a simple cash-cow brand like certain other franchises. The author has wisely resisted to be commercialized and the focus has always remained on his books, making the storytelling and the characters the real stars of the Discworld. I can highly recommend Terry Pratchett’s books especially for everyone not liking dead-serious and heroic fantasy – the Discworld tales are the exact opposite and while they are great entertainment, they are also interesting, heartfelt and gripping stories with real characters and, of course, a completely unique sense of humour. This article is only one of several for the 30th anniversary of Discworld – over on DVDLog there will be more reviews of the animated and live-action adaptations and on this blog I am going to write some articles about the Discworld computer games soon. There might even be a new page about Terry Pratchett and Discworld when I finally have upgraded the ancient book section. » The L-Space Web is the oldest and most interesting website about Discworld and Terry Pratchett. 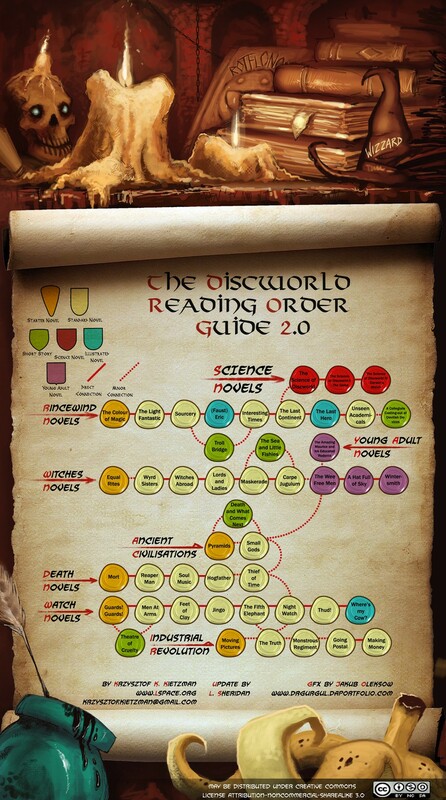 » The Discworld Reading Order Guide on L-Space is the best way to get acquainted with the novels. » The Discworld Article on Wikipedia is also a good starting point. » TerryPratchett.co.uk is the official website of the author. » PJSM Prints is the site of Paul Kidby, the main Discworld illustrator, who sells prints and other merchandize.